Have you tried Coconut Flour, yet? If not then this is the right time to start. The advantage of Coconut Flour compared to other flours is quite simple: It is rich in beneficial nutrients and by nature gluten-free. Such a beneficial and light combination is offered by no other flour. Coconut Flour is perfectly suited for baking and cooking. A small amount will already add an exceptional flavor to your favorite dish. Give it a try and experience it for yourself! 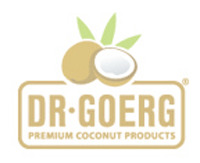 Dr. Goerg Premium Raw Organic Coconut Flour contains about 12 % of valuable coconut oil and about 40 % of fibers. With a protein content of 20 %, coconut flour is quite extraordinary compared to more traditional flours. In addition, the protein is of a high biological quality. This fiber-rich flour will boost your well-being and your physical awareness. The taste however won’t suffer – coconut flour provides a full aroma to all of your baking and cooking endeavours. There’s good news for those with gluten intolerance: coconut flour is naturally gluten-free. Organic coconut flour is perfectly suited for baking cakes and other pastries. The next time you want to bake that favorite cake of yours, simply substitute up to 20 % of cereal flour with coconut flour. When making thin pancakes, the cereal flour can even be completely substituted with coconut flour. Savory and warm dishes like soups, stews, curries, casseroles and sauces also benefit from the use of coconut flour and are enhanced with a distinctive aroma. The same goes for desserts and drinks like milkshakes and smoothies. Why don’t you try mixing up to 2 spoonful of coconut flour into your yoghurt or muesli. Even small amounts will add a subtle flavor to all of your dishes and benefit your overall well-being. Would you like to add high-fiber lightness to your cuisine? Then allow yourself to be inspired by our delicious recipes with coconut flavor!